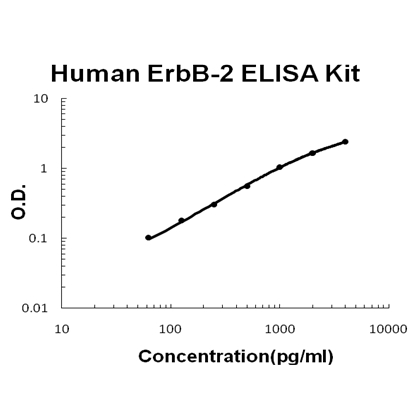 Sandwich High Sensitivity ELISA kit for Quantitative Detection of Human ErbB-2. 96wells/kit, with removable strips. HER2/neu(also known as ErbB-2) stands for "Human Epidermal growth factor Receptor 2" and is a protein giving higher aggressiveness in breast cancers. It is a member of the ErbB protein family, more commonly known as the epidermal growth factor receptor family. HER2/neu has also been designated as CD340(cluster of differentiation 340) and p185. It is encoded by the ERBB2 gene.HER2 is a cell membrane surface-bound receptor tyrosine kinase and is normally involved in the signal transduction pathways leading to cell growth and differentiation. It is encoded within the genome by HER2/neu, a known proto-oncogene. HER2 is thought to be an orphan receptor, with none of the EGF family of ligands able to activate it. However, ErbB receptors dimerise on ligand binding, and HER2 is the preferential dimerisation partner of other members of the ErbB family.1 The HER2 gene is a proto-oncogene located at the long arm of human chromosome 17(17q21-q22)2. Tao L, Suhua C, Juanjuan C, Zongzhi Y, Juan X, Dandan Z. Virol J. 2011 Mar 11;8:114. Doi: 10.1186/1743-422X-8-114. In Vitro Study On Human Cytomegalovirus Affecting Early Pregnancy Villous Evt'S Invasion Function.